SCMS Group of Educational Institutions signs MoU with Shimane University Japan at SCMS campus in Cochin, India on 18/12/18. 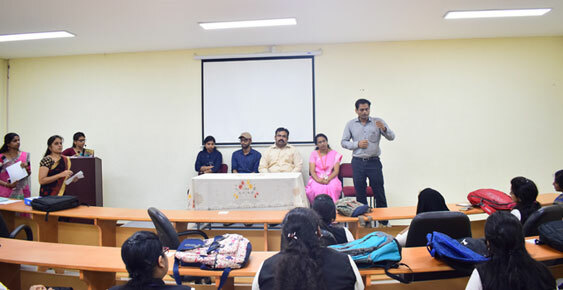 SCMS Group welcomes Dr. C.N.Narayana !! SCMS Team lead by Prof. Pramod P Thevannoor, Vice Chairman SCMS and Dr. Varun G Menon , AProf. SSET and Head International Relations was in Ho Chi Minh City , Vietnam. Here they have entered into MoU with two Universities. 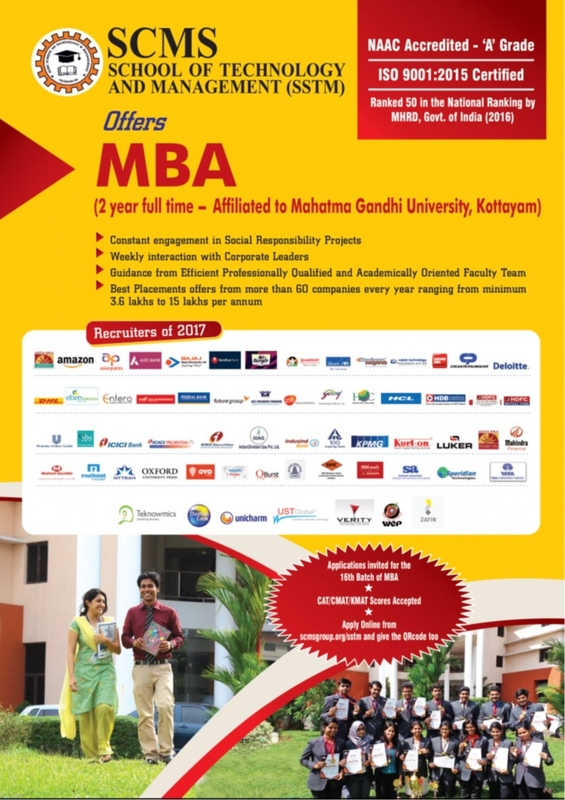 Admissions Open for MBA 2018 - Apply Now !! The second KMAT Kerala Entrance Examination 2018 is proposed to be held on 24.06.2018. The Notification has already been issued on 08.03.2018. The fifth Notification is attached herewith. SCMS Students win Overall Trophy at D'ignito 2017 Fest !! 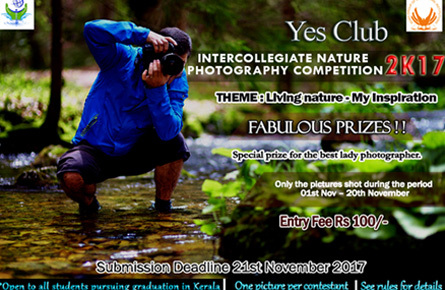 Inter Collegiate Nature Photography Contest - Organised by YES CLUB. Dear Parent, Greetings! It is proposed to convene the faculty - parents' interaction meeting (Open House Session) as per the following schedule to review the progress of studies of 1" Year B.Tech students. Alumni of SCMS School of Engineering and Technology (ASSET- UAE) is to unite together for Onam Celebration. Inauguration of LAKSHYA 2017 was held on 25th September 2017 at 10.30 a.m at Kalamassery Government School. 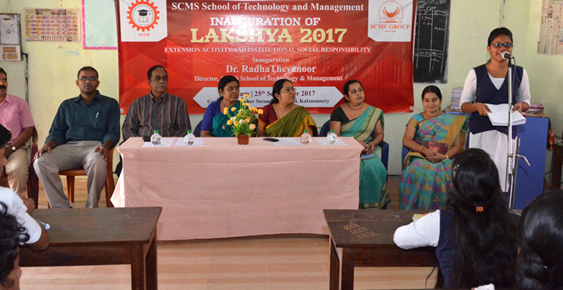 Dr. Radha P. Thevannoor, Registrar and Group Director inaugurated the function. Happy to inform that Two Projects from Electronics and Communication Engineering Department and One project from Computer Science and Engineering Department of SSET has been selected for Kerala State Council for Science , Technology & Environment funding of 15,000 Rs and the projects has been selected for KTU-KSCSTE Techfest 2017. The III session on 3rd January was graced by the esteemed presence of Ms. Waltraut Ritter. She is the founder of Knowledge Dialogues, Hong Kong. 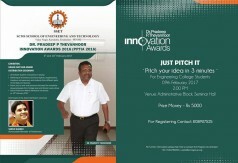 A Call For Participation In The PPTIA !!! SSET To Use Green Electricity From Sunlight With Solar Panel Systems !! 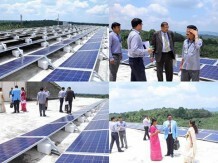 Engineering college going Green with energisation of Solar Panels powered by Tata Power Solar !! Department of Electrical Inspectorate , Govt. of Kerala has accorded energisation for the Installation of 50kW On Grid Solar System ( By Tata PowerSolar) at the SSET premises . Students taking up project to improve the water distribution in the irrigation canal network in the State using German Technology.